Its been just a good old around the clock of building rad stuff to make people smile... My year long full time term of working at the Exploratorium Science Museum ended the other day and but was kept on as a builder/designer part time to keep the fun going so I am super thankful they see my love for building the joys of science. The coolest part of that museum is when they find people like myself and others they really like they give you freedom to do other stuff without any pressure, its really what makes the place such a special place to me and what keep me wanting to bring new concepts and ideas to that place. They see the true benifits with having me more as a freelance dude without the pressure and they really notice the results when they get my true love of my craft in every project I work on for them. The other projects have been for Red Bull and all the events they have been hosting such as the Training Grounds Media events they have been holding, which are Red Bulls enter in to the Esports Online gaming such as StarCraft 2 and other games... 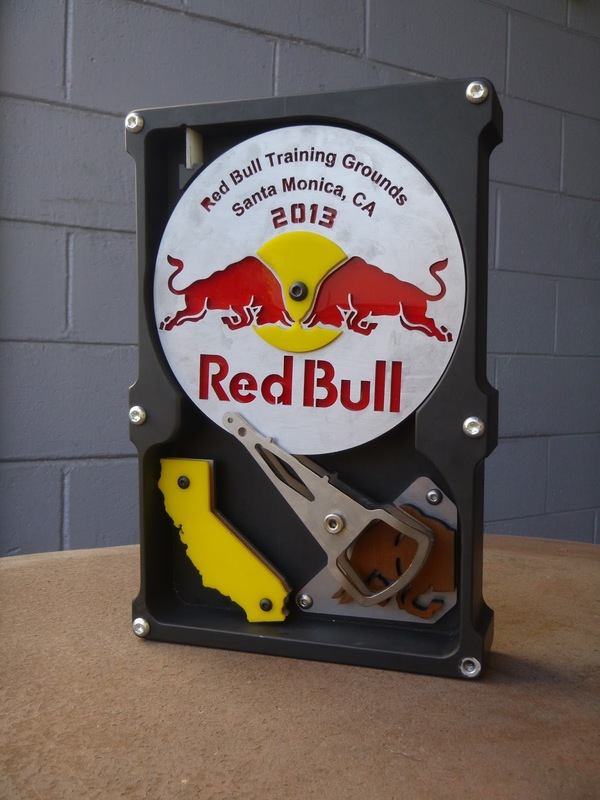 They have really just given me freedom to be creative and design some of the most rad trophies for them. The big event for me this year is the America's Cup sailing race, where Matt and I will team up to build one of the most rad trophies Red Bull has seen for their Youth's Cup race using the AC45 boats Red Bull bought... Stay tuned its going to be so rad. Welding away on the Exploratorium's " Bay Window Exhibit "
Heavy rock lands first then the swirl of light sands show how it travels. This photo is Erik Diamond " El Jefe " giving it a spin without the covers on it, so we can see all the bearings spin freely. Overall Adam, Shaun, Erik, Herb, Brice and Jesse and who else I am missing really nailed it with this exhibit, it really fills the side of the museum with some rad learning fun projects. I have found that its not worth risking it by using hole saws and other cutters trying to cut holes in the spheres because of damage, so this is how i do a lot of the bigger holes about about an inch in size. Don't risk your hands or body by trying to drill it with the big sizes. Gabes figure pictured in the top left. When setting up the small stainless steam generator I purged it with argon and used lab clamps for the torch and did it on the welding positioner. The foil is set up to cover the other 2 inch NPT fitting but not to hard because i want the argon to escape slightly so it doesn't pressurize and blow out the weld. I machined some parts for holding the gauge on the stainless steam ball, still got a lot to do but its a start. I have been filling orders for Exile Cycles Gas tanks and Gabe has been watching and following along on his personal projects. Hes building a tail for a cafe racer out of a little honda gas tank. Its 4 AM does your mom know where you are? 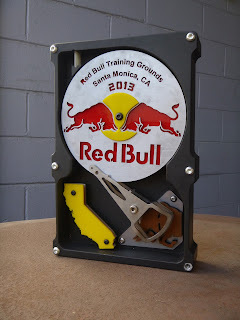 Built this trophy with Matt Carney in under a week turnaround... Custom Billet aluminum keys and full sheet metal construction ... sick !! Its so rad.. I got to take it out for a afternoon .... Talk about fast !!! .000 on the money.... sheet metal parts ! I bailed out to Cheyenne, WY the other day to go visit Union Pacifics Steam div. Tom the owner of adams and chittenden Glass in Berkeley made me such a rad Lab style sight glass. These guys make some of the Gov. Labs most crazy glass experiments pieces. Lucky for me, Tom is a huge fan of the Exploratorium and also just down the street from my shop, so he was stoked to help on the project and make this wild glass tube for the water level. Don't ask how my brain got on this one. Well enjoy some of my joys in the last months. Theres more to come but I figured all the piles of emails asking if I was dead or gave up on the MLS site forced me to do some updating and letting you all know I am still here turning the handles making chips and sparks..